For those of you who asked, I am including here the full draft and instructions for weaving the Swedish Lace Towels. To determine the threading, Use the Block A thread by thread to replace every A on the threading portion of the profile draft and the Block B thread by thread to replace every B on the threading portion of the profile draft. The last thread, shown in yellow in each block substitution is called the incidental thread. The incidental is used only when Block A is followed by another Block A, or Block B is followed by another Block B. Obviously, if Block A is followed by Block B, the incidental does not need to be used, because Block B starts on shaft 4, and when Block B is followed by Block A, the incidental does not need to be used, because Block A starts on shaft 1. The first and last block in the profile is marked PW for Plain Weave, and is threaded on shafts 1 and 4. The first portion of the thread by thread draft is shown below. Warp length: 3 yards for two towels or 5 yards for four towels. Weaving: for each towel: Weave 2 inches for hem, weave as drawn in for 28 inches, weave 2 inches for hem. Finishing: Machine wash quick setting. Iron while damp. This entry was posted in Uncategorized, Weaving and tagged cotton, hand weaving, Handweaving, handwoven, Loom, Swedish Lace Weaving, tea towels, towel of the month. Bookmark the permalink. I loved the look of these towels in your previous post so I’ll be saving this draft for future reference! Thanks for sharing all these details! I didn’t use the other treadlings, I can’t remember why they are there! Just at the beginning and end. Me again. Ok a fellow weaver on the four shaft group cleared things up for me! Now my question is on treading. I begin with pw for 6 picks. Then block A-B-B-A-A. Do I then go back to repeat starting with pw or go on to block A etc? Thank you! So, if you look at the profile draft you will see that the plain weave only forms a border around the whole piece, and plain weave is not used again within the towel. Follow the block order shown in the profile draft. 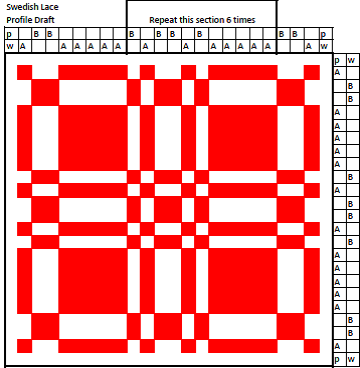 With Swedish Lace, the key is that the thread highlighted in yellow is only used when A follows A or when B follows B, and is not used when B follows A or when A follows B. (This ties down the float and preserves the odd-even sequence of shafts.) If you are still confused, research Swedish Lace.